The US will be getting the game released on June 18th. The game has also just recently recieved a rating for release in Austalia, indicating a Pal Release. 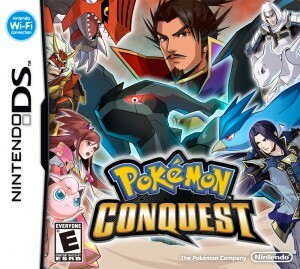 The game will be getting a G rateing but interestingly its been rated under the title Pokémon + Nobunaga’s Ambition, so whether the game will change its name closer to release or if its being released with its Japanese name is currently unknown. What’s also unknown is any details on a European Release, chances are high, however there’s no details for Europe yet. Right, lets get onto the really cool stuff. 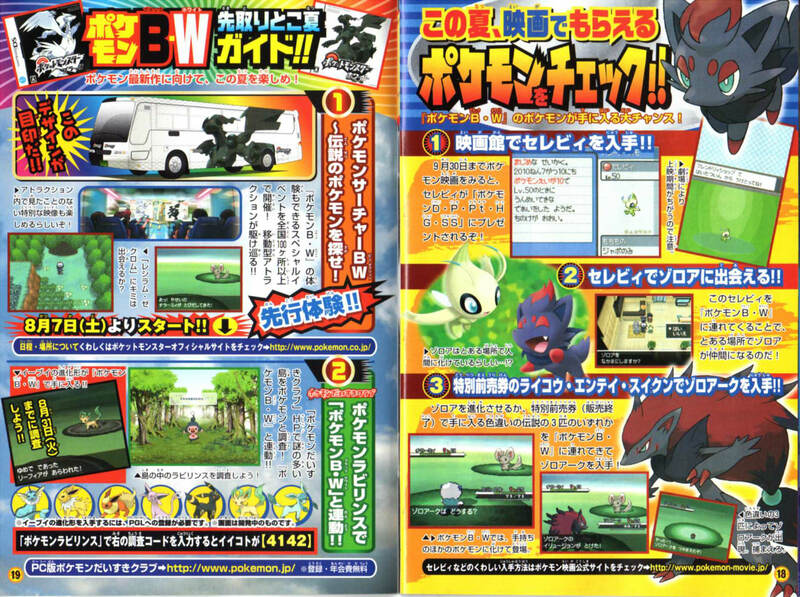 CoroCoro magazine has started to surfice on the internet and this month, Lots of Black2 and White2 news is inside. Pokémon Smash is due to reveal this info this Sunday in Japan, historically its not revealed much more so this is all the infomation we’ll probably have for a few weeks, but Pokémon Smash is due to have some video action of B2&W2 so we’ll hopefully be able to link you to that at the weekend. So that’s the world map… and there’s a fair bit of Ice covering it. Why? Maybe because Kyurem has done something to the world, Maybe its something to do with Global Warming… or maybe its an effect to hide parts of the map so we can be surprised later on. Why would we need to be suprised. Well despite that B2&W2 are still set in the Unova region, the games are actually set 2 years after the first and as such, there’s been a few changes around the place. We know that there are new area’s of the map, as well as changes to existing places, Route 4, for example, not only has the road between the Nimbasa and Castelia been completed, but there looks like there’s a setlement popped up. And the moat that surrounds the Entra Link has dried up. There’s a lot of minor differences between this artwork and the original Unova Artwork, including Liberty Guarden, where Victini is found… maybe Victini wont need an event this time around? 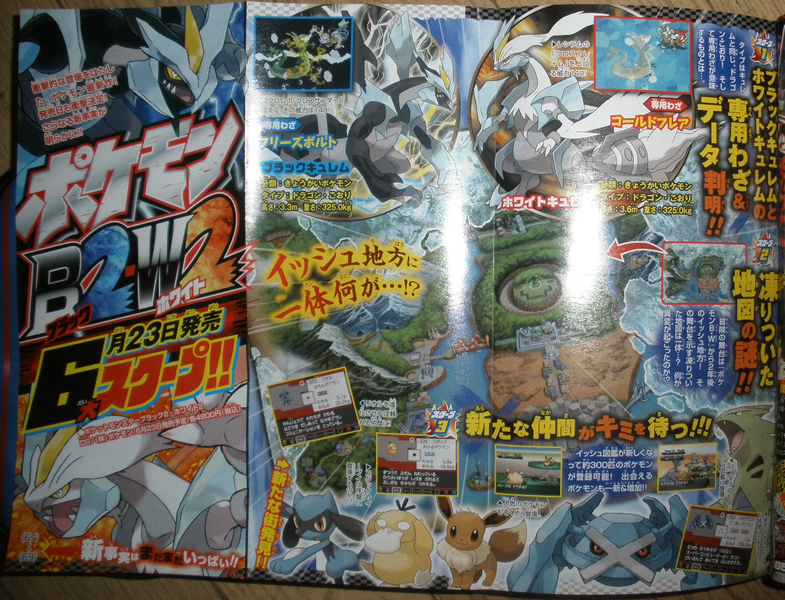 other info from this page, Black Kyurem and White Kyurem’s both height and weight’s are revealed. Black Kyurem is 3.3m tall and 325 kg while White Kyurem is 3.6m tall and 325 kg. We also know that Black Kyurem will know Freeze Shock while White Kyurem will know Ice Burn. 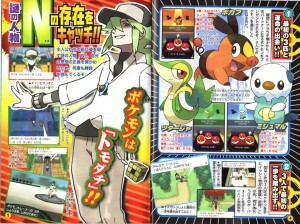 Lastly on this page, details on the new Unova Pokédex. In Black and White, it was hinted that some, if not all, of the none Unova Pokémon had escaped from the transfer lab. Well now they’re becoming Nationalised as a lot of Pokémon are added to the Unova Dex. Cranking up from 156 to 300, its adding pokemon such as Psyduck at 026, Riolu at 033, and Metagross at 246 (with thier evolutions at assuming the numbers next to them). The dex is also adding Arcanine, Lapras, Eevee, Mareep, Tyranitar, Buneary and Weavile (along with thier Evos, presumably) amongs others old and new in the dex. The next page shows characters. On the right are the two new trainers, male and female, that you’ll have to chose from in Black2 & White2… While the guy in the red shirt on thier left is the new Rival. Aparently in one of the boxes he’s quoted as saying ‘From now, I’m going to rage!’ – so he’s going to be a bit more anger managment issues than the last rival. He is, however, still a childhood friend of the rival. 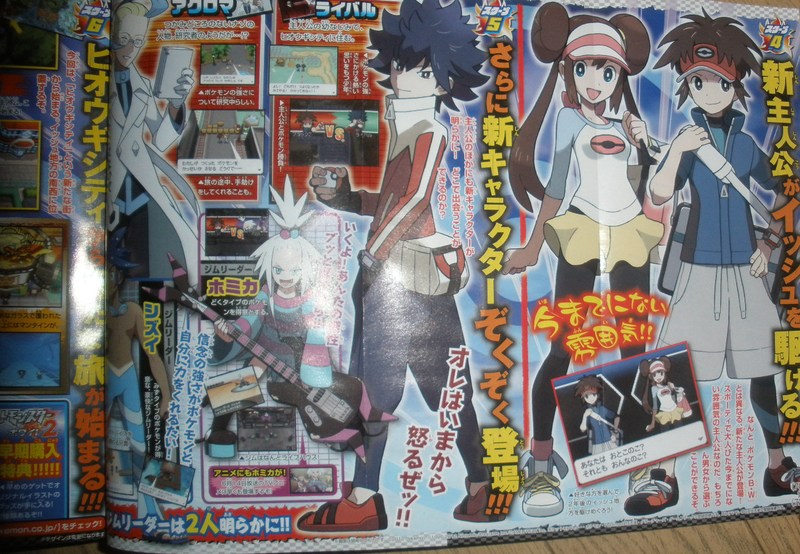 The girl with the guitar will show up in an Anime Episode in Japan in June, She’s Homika, a new Poison Gym Leader. Her gym is aproriatly a Club where live bands play. Although you could see these two new characters on the last image, this is a better shot of these two. 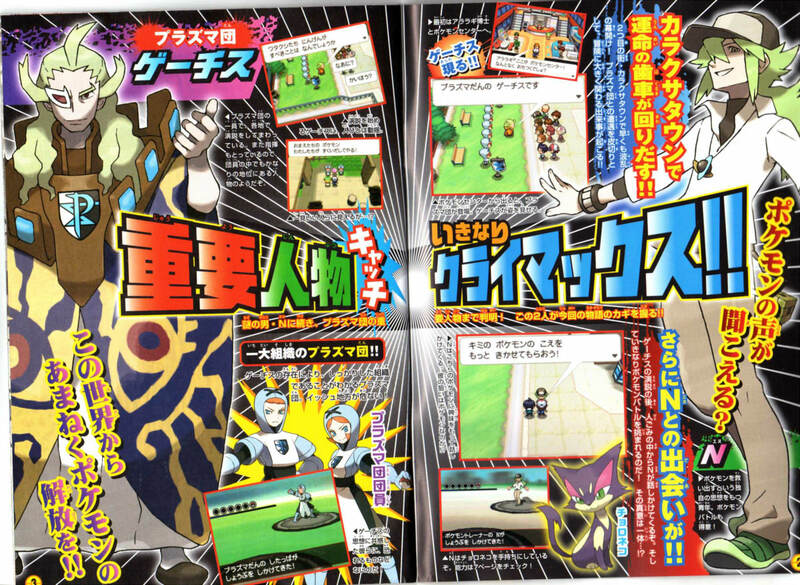 The tanned guy in the tight blue swimming costume is Shizui, the new Water Gym Leader. Akuroma is the new researcher, who’s looking into Pokémon Strength (probably in general and not the HM move as I first thought when I read that) – he’s described as a bit mysterious. One of the new towns will be Hiougi City, its on the south West of the map and shown in images at the top left of the scan above. It’s going to be the new starting city for our new trainers. Its got a cool lookout area, and contains a Trainer School and a Pokémon Center. Again, changing the rules of Pokémon games, no player has started off in a City, or had a Trainer School or Pokémon Center in thier home town… so 3 new firsts in one place! 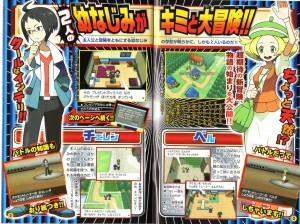 The bottom of that page shows off some of the new buildings around Unova. The coolest one, an underwater tunnel you can walk through, with Mantine that floats by over head… even if there are no other fish that float above you – that is awesome in my book! That’s all we’ve got for now. Any more pops up we’ll throw it up and hopefully, at the weekend we’ll have some video of Black2/White2 in action. Apart from random updates to some minor features on the site, we’re actually pretty busy back here at The Pika Club. As such, some big news has actually managed to pass us completly without our realising it. But thankfully I’m used to doing news round ups. 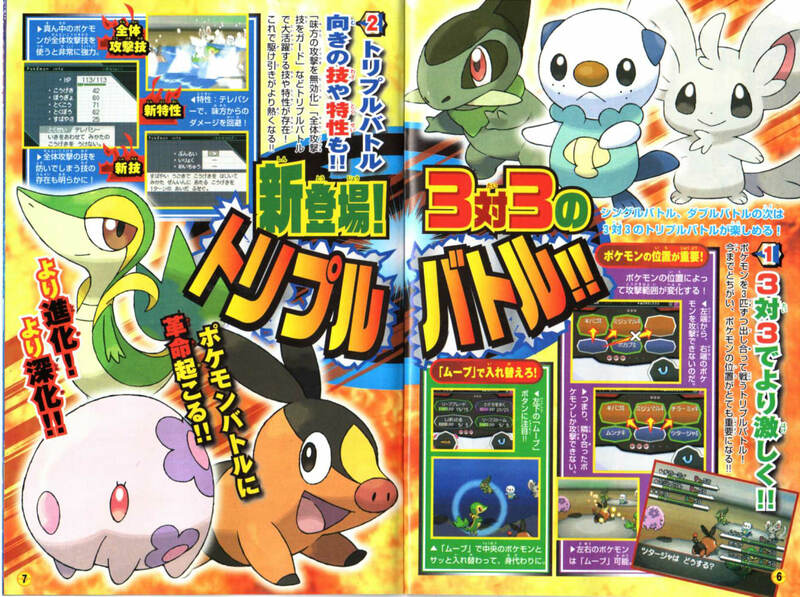 Ok, first up, the latest issue of CoroCoro magazine has been released in Japan. Not a lot of info was in it regarding Black 2 and White 2, other than showing the new Box Covers (which we’ll upload into a new Black 2 & White 2 Gallery), which confirmed that these games will be DSi Enhanced like thier predesessors (dont get too excited, as Black & White’s DSi Enhanced was only a ‘Face Time’ like App that only worked over the Wireless Connection). What the Magazine seems to say though was that Black 2 & White 2 WILL be a new story and have new fetures. 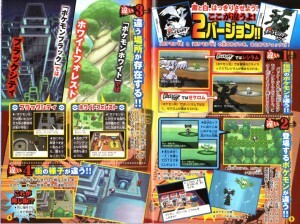 This means that Black 2 & White 2 are the first Direct Sequel games for the main pokemon franchise. 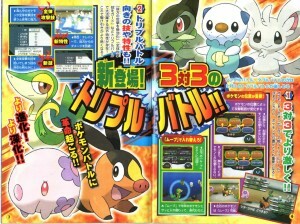 The Magazine also revealed Keldeo’s Download promotion for Japan this year. Keledo, the Colt Pokémon, is the 4th Legendary Musketeer Pokemon along with Cobalion, Terrakion, and Virizion and will feature in this years Movie. 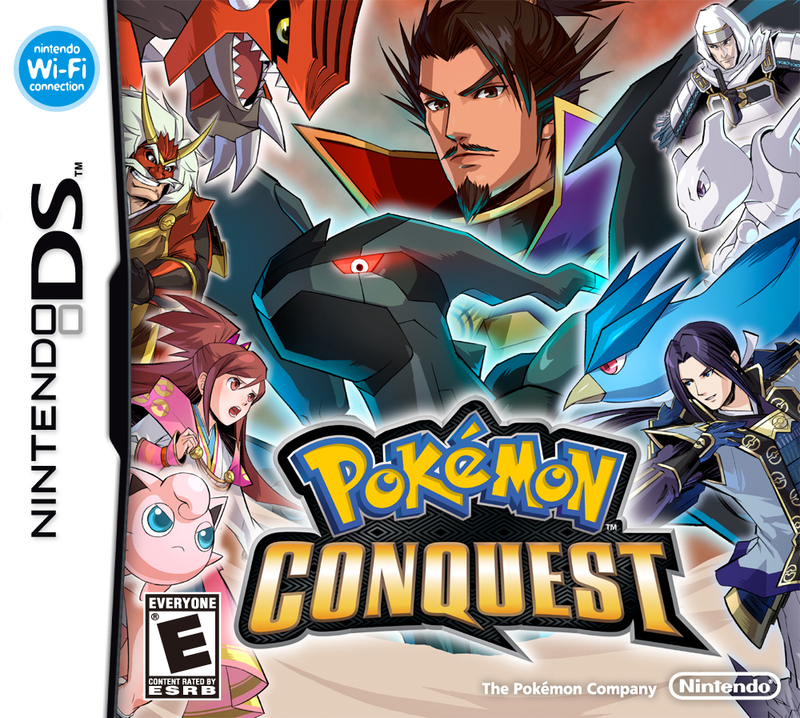 Keldeo will be given away at level 15, and have Aqua Jet, Sacred Sword, Hydro Pump and Close Combat. What’s interesting is that this seems to be the Pre-Order give away Pokemon. Every year, japanese people who pre-order thier tickets for the Pokemon movie are able to download a special pokemon, while a second pokemon is usually given away at movie theaters during the run of the movie itself. Usually the latest event pokemon (and star of the movie) is the one given away at theaters, to have Keldeo as a pre-order bonus is interesting. It also seems to confirm the rumours that Meloetta will be given away this year as well, since the Musical Pokemon will be staring in this years Pikachu short. The reveal of a Meloetta give away was accidently revealed on the Japanese version of the official site. No Dates or move set on the Meloetta, but the Keldeo give away is between June 23rd – August 31st and will be downloadable to Black, White, Black2 and White2. Oh and here’s the important one – Got an English version of Black or White – quick, Wi-Fi Mystery Gift NOW. A level 100 Zekrom is available to download if you have black while Level 100 Reshiram is available if you have White. They also have the special Moves Mist and Haze respectivally. AND what’s cooler is if you upload that pokemon to the dream world, it will unlock a special section that will let you get a special Zekrom or Reshiram C-Gear. You can only get one of the c-gears depeding on which pokemon you uploaded and you can only get 1 per game, so no chance of getting both – The pokemon are available via Wi-fi until 8th April so get on it now! The main man at Gamefreak, makers of Pokemon, Junichi Masuda was on Pokémon Sunday this week… although there really isnt anything to report much. 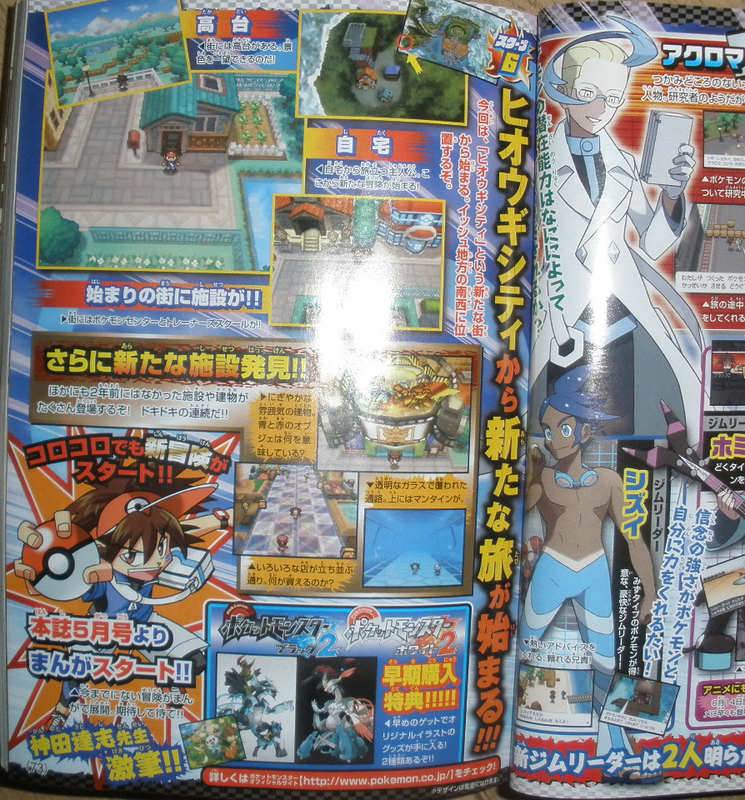 Masuda didn’t reveal anything new on the show… well he would have done had CoroCoro Magazine not leaked 24 hours before. Masuda revealed the Purple Cat Choroneko, claiming it was a world exclusive – true had CoroCoro not leaked and then there was the advert for that pre-bw show as well but otherwise, yeah exlusive! See, this is the problem you have when you pre-record the show. 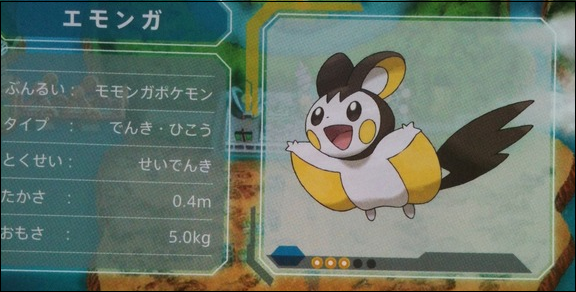 We knew N had a Choroneko, but Masuda reveales that he’s part of N’s starting line up the first time you fight him. 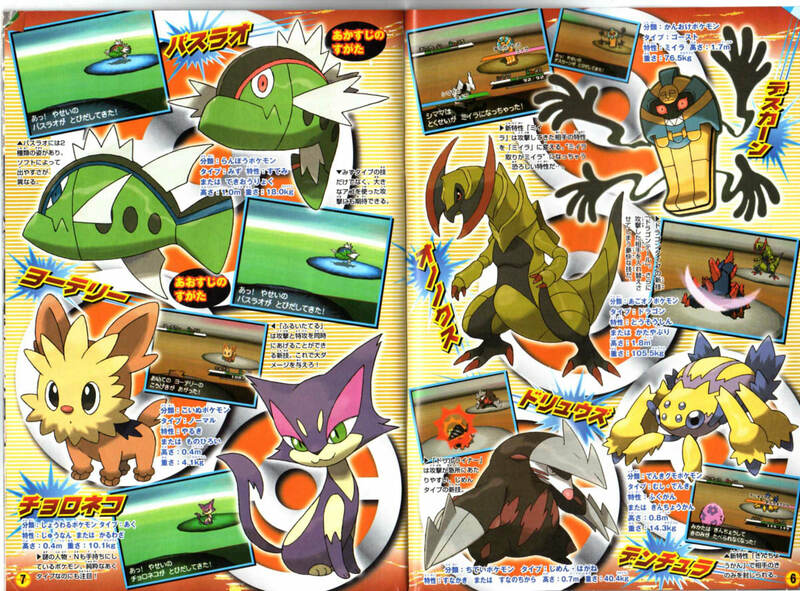 Masuda also revealed Desukaan, Denchura, and Ononokusu, again nothing new thanks to CoroCoro. A couple of pieces of info that may be interesting, Mijumaru learns the move ‘Shell Blade’ at level 7. Mamoko, the girl who helps you access the Dream World, gives you HM01 Cut. We werent sure if HM’s were going to be in the game since TM’s are now reusable, but here’s proof otherwise. Well, that’s all we have for the moment – during the next week, Pokemon Black and White could possibly be leaked, and we’ll learn all what we want to know about the games – get ready people, the news craziness is about to begin! 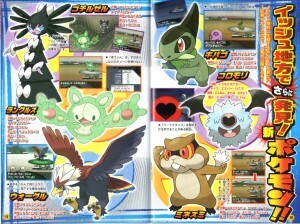 September CoroCoro Leaked – New Pokémon! 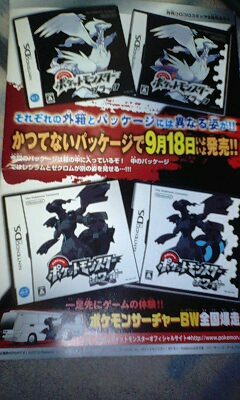 Japanese gaming magazine CoroCoro has leaked for what will be the last time before Pokémon Black/White’s official release in Japan and so as to be expected there are new Pokémon galore. So many, in fact, that I’m just going to include the scans here for you to look at and include the new information after the jump. Enjoy! As a quick note as the Internet has been rife with speculation – the first starter evolutions have been confirmed as real. Ok, so here’s a weird one. 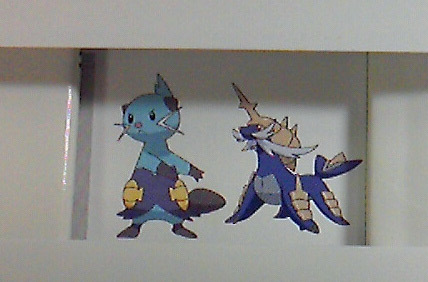 There are pictures floating around the internet (originating from 2ch like every other pokemon leak) of images of the Evolutions of the Pokemon Starters. The strange thing about them is the constant conflicting reports we’re getting of their legitimacy. One minute they could be real, the next their faked… then the next some super secret source comes around and says they’re real. Well, that’s them – my personal opinion is that the art style, and how they’re presented, dont match up to all the previous reveals so far. That of course doesnt mean they’re fake either, and there are elements in all of the evolutions that i can easily see being there anyway. What do you think about these evolutions, like or dislike – either post a comment or drop by the forums and let everyone know, and we’ll keep you updated with how this one turns out as we find out. In other ‘its so obvious it could be true or could be faked’ news, remeber Yanappu? 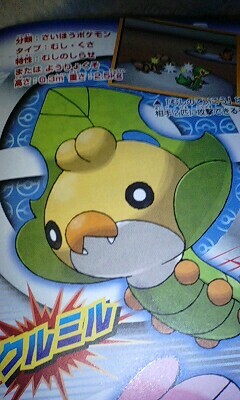 the green monkey thing revealed officially by Pokemon Sunday a couple of weeks ago? Well he might have a couple of brothers… or someone might be playing an obvious trick on us. You can (only just) see a Blue looking monkey shape next to the back sprite of Yanappu in the above screen shot. Its not a shiny version, as the head does look slightly different. So does Yanappu have an alternate version? Well acording to the information posted on 2ch with this screenshot, it does. Along with the Grass Type Yanappu, there will be a Water Type version called Baoppu (pictured) and a Fire Type called Hiyappu. This could make sense. In Ruby and Sapphire, Pokemon like Plusle & Minun and Solrock & Lunatune were brought in to help promote the gimick of 2v2 battles. With 3v3 battles now being introduced in Black and White, could they be trying to do the same thing – we already know that Yanappu has a move that is very usefull in 3v3 battles (acrobat), which the other versions are rumoured to know as well. Then again, somebody could be taking that logic to fool us, so again, this one could turn out to be faked – we’ll keep you updated on this as well as we learn more. Searches for CoroCoro magazine scans and leaks rank among our most popular keywords and so I’ve added an archive of all the CoroCoro scans we have which you can access from the ‘Galleries’ dropdown menu. Right now it only goes back to May 2009 but I’d like for it to go back further. If you have any relevant (ie about Pokémon) CoroCoro scans please get in touch and help us flesh out our archive! To not get lost under the latest news posts, I’m posting all this new info in a new post instead of editing the old post. If you missed it and need to read all the original stuff posted from this months CoroCoro Magaizine, head to This Post. First up, we’ve got a picture of the pokemon from the Pokemon Demo Bus tour we mentioned last time, Basurao. More news from CoroCoro, we’ve got the full scans of CoroCoro magazine after the jump, for now, we’ll just cover the additional info we didnt cover in our previous post. 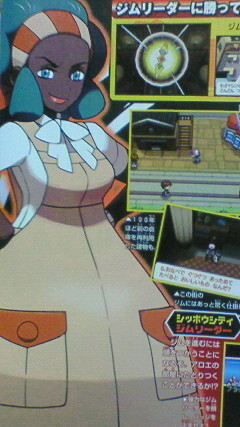 It’s mentioned in Gigaiasu’s reveal that the Sturdy ability has changed a little. Previously it would prevent you from being One Hit-KO’d by moves designed to do just that, such as Fissure, Guillotine or Horn Drill to name a few. However you could still One Hit KO the pokemon if you used a move that had type advantage, and you were high enough stats or levels. Sturdy now prevents that from happening, meaing any move that would Knock you out in One Hit will leave you with 1 hit point, kind of like having the Focus Sash item attached or using Endure. Season’s play a bigger part of the games than previously reported. We mentioned that Shikijika would change its apearance depending on the season, and that the world around you will change every month as the season changes, but we now know that its more than just an asthetical change. Certain areas will only be accessable during certain seasons, for example during winter, the snow will pile up by the side of a cliff, allowing you to walk up it and get to the top. It’s also been revealed that the seasons can also affect what Pokemon show up in an area, an extention on the night and day changes introduced in previous games. An amendment to the previous news story, the starting town is Kanokota Town, not Kanoko Town as previously reported. Here’s some big news, TM’s will no longer disapear after you use them to teach a Pokemon the move. In previous games, a TM was only usuable once unlike the HM’s which could be used over and over again. Now TM’s will be usuable multiple times like HMs. It is unknown if HM’s will still exist in Black and White or if they will now all be TM’s. 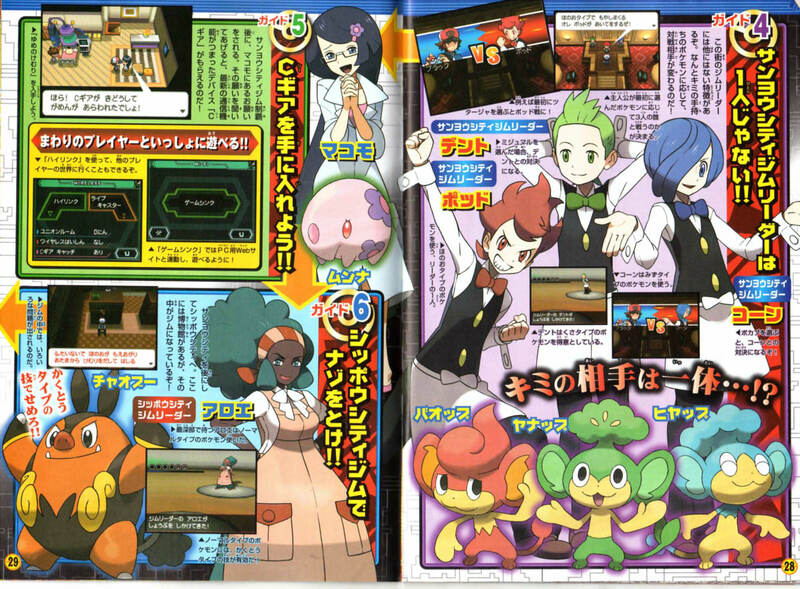 Pokemon Musicals, the new Contest mode, will be held in the Musical Hall (we dont know where this is located yet). A Good Case will hold all the costumes and accessories used for the Musicals, and as seen in a recent trailer, these are worn/held by pokemon a lot more accuratly that the accessories in D/P contests. At the end of Musicals, you can recive gifts from the audiance who liked your performance. Makomo, the friend of the Professor and the person who gives you the C-Gear, lives in Sanyou City, location of the first Gym. In HeartGold and SoulSilver, the Pokewalker let you catch Pokemon that had moves the Pokemon would not ordinarilly know. The Dream World will be taking this idea one step further, offering Pokemon with Abilities they would not normally get. An example was given of a Vaporean who gets the Hydration abilty. There will be no Berries grown naturally in Isshu, the only way to get them will either be via Pokeshifter attached to your pokemon coming across from D/P/Pt/HG/SS or via the High Link as rewards. Interestingly you can trade the Berries and Items you get through the High Link by leaving them on some Wooden Shelves for other people to pick up. To offer more Personalisation and Customisation, the C-Gear will offer the ability to download more Pokedex Covers, C-Gear Covers and Music for the Pokemon Musicals using the Global Link feature. Remeber we talked about the different Box arts for the games revealed on one of the pages, well it turns out that one’s the Game Case’s art while the other is the art on the box the game case will be inside. Seems a waste of packaging to me – but hey, 2 box arts for the price of one, i’m not complaining. The only other thing CoroCoro mentioned was showing the 2 new Characters for the new Anime Series, Best Wishes – which will Follow Ash’s journey after Sinnoh as he heads to the Johto region. Iris, the girl, and her Kibago will obviously be replacing Dawn in the series. But bad news Brock fans (looking at you here Anne), looks like our favourite Pokemon Breeder is heading home for good and is being replaced by Dento, the first Gym Leader of Isshu. He’s also supose to be knowledgable on Pokemon, and as a First Gym Leader of the region, is very similar to Brock when he was first introduced. And that’s all the information we’ve been able to get from CoroCoro Magazine this month – check after the Jump for ALL the scans and we’ll bring you more news when we learn it. First up, a couple of New Pokemon have apeared thanks to eagle eye’d Japanese fans attending the Pokemon Black and White Promo Bus Tour. First up, Emonga. This is the Flying Squirrel Pokémon, and is an Electric/Flying Type. It stands 0.4m tall and weighs 5.0kg. It will have the Static Ability. Previously revealed in Owa Suta trailers, this is Gigaiasu, the High Pressure Pokémon and is a Rock Type. It will be 1.7m tall and weigh 270.0kg. It will have the Sturdy Ability. There is apparently a Pokémon called Basurao, although we have no Pictures or info for this pokemon other than it will know Aqua Jet and Uproar. 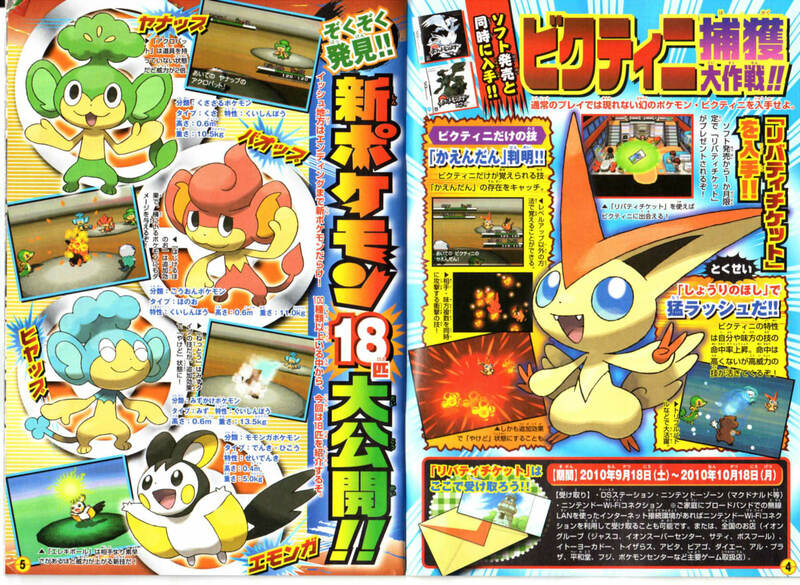 CoroCoro magazine is slowly being revealed. 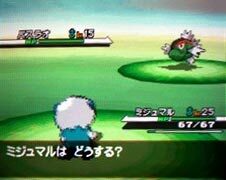 There was a large scan with several Pokémon, however this is looking like it’s a fake (and if true, its a very good fake) – we’ll put it up here if it turns out to be genuine. For the moment we do have a couple of pieces of info. 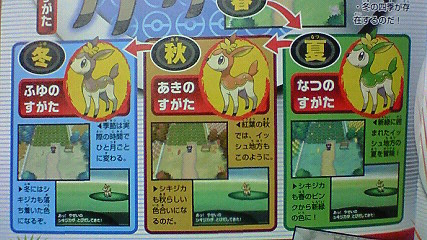 Shikinjika, a deer Pokémon previously revealed in various places, will change its apearance depending on the season in the Game. Black and White feature a new feature where every Calender month (using the DS time/date) will be a new Season(meaning it will cycle spring-summer-autumn-winter 3 times during a real world year). During Spring, Shikinjika will be Pink, which is how its been shown in the official artwork we’ve seen previously. During Summer, it will change to Green. It will be Orange in Autumn and it will be Brown druing winter. Shikinjika will be a Normal/Grass type and apperently has the Chlorophyll ability. In addition to Shikinjika, the terrain of Isshu will also change based on the seasons (expect snow in winter, leaves fallin of the trees in Autumn, etc). Edit: 8 Aug First up, some news from Pokemon Sunday last night – they aired another trailer promoting Victini – however this did reveal some facts about the event you will do once you have the Liberty Ticket. Downloading the ticket will allow you to access a house at the Liberty Garden Tower, where you’ll battle (and capture) Victini. It will know the moves Quick Attack, Endure, and Confusion along with the previously revealed new move Complete Burn. Its ability Victory Star raises the Accuracy of its attacks and will also raise the Accuracy of its team-mates attacks when used in a double or tripple battle. They also revealed sillouetes of Pokémon they promised to reveal next week, but we dont want to wait that long – so we’ll use CoroCoro Magazine to give us some brand new Pokémon Info now. 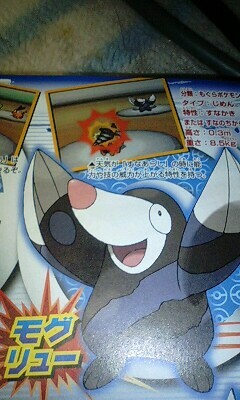 First, this is Moguryuu, the Mole Pokemon. It’s a Ground type, is 0.3m tall and weighs 8.5kg. It has the abilities Sand Throw or Sand Power, the latter of which will increase the power of attacks during sandstorms. This is Kurumiru, the Sewing Pokemon. It’s a Bug/Grass type (which I suggested it may be). It will be 0.3m tall and 2.5kg in weight. It’s abilities will be Swarm or Chlorophyll. It has a new attack called Bug Resistance which is said to hit two Pokemon at once (and is most likely a bug type move, given the name). Last of our big pictures, this is Mamambou, the Nursing Pokemon. 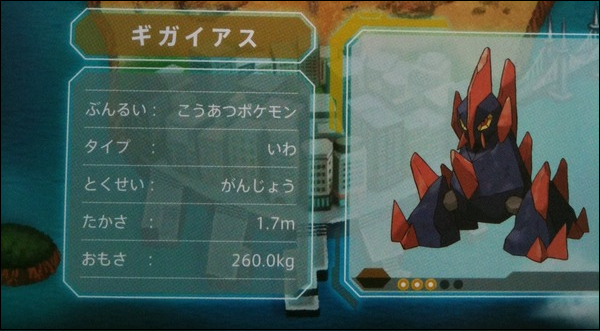 It’s a Water type, stands 1.2m and weighs 31.6kg. It will have the abilities Hydration or a new one called Healing Heart, which cures teammates of status conditions. This large page deals with every revealed pokemon currently and shows a couple more details for Pokemon we’ve seen but hardly knew about. Lastly, some more info on Shikijika. It is the Season Pokemon, a Normal/Grass type standing 0.6m and weighing 19.5kg. Its abilities will be either Chlorophyll or a new one called Herbivore, which sounds like it is a Grass version of Flash Fire, raising attack when hit by Grass-type attacks. 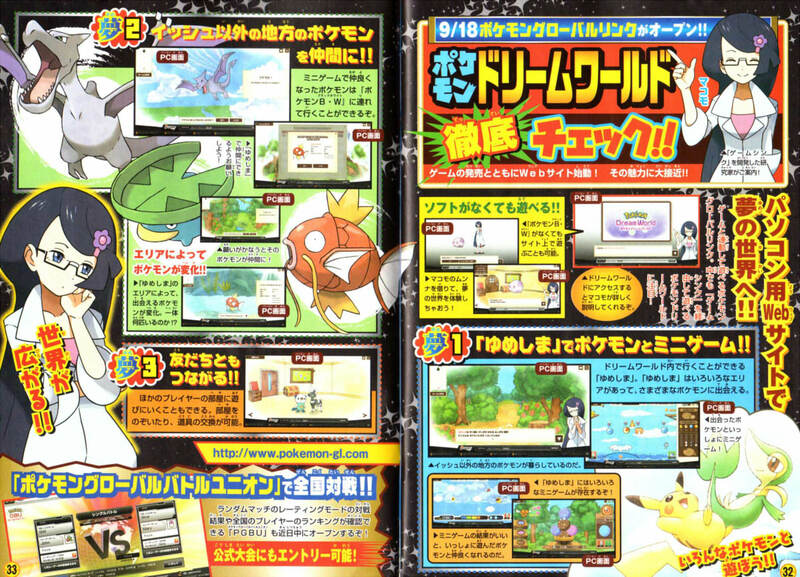 Other details coming out of CoroCoro magazine states that your hometown will be Kanoko Town. 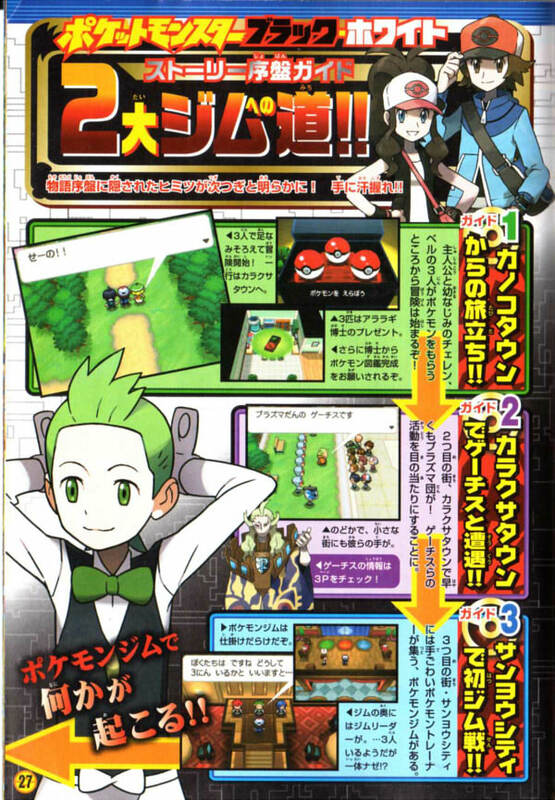 You’ll meet Team Plazma (probably for the first time) in Karakusa Town. 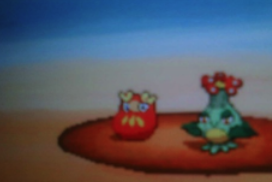 The first gym is in Sanyo City and has Dento as its leader while Anole will lead the second Gym in Shippou City. Yet another new variation on the 3v3 battle has been mentioned, the Rotation Battle is a 3v3 match where you can only chose 1 of your pokemon to attack each turn, meaning not only do you have to attack, but you have to guess how your opponent will attack as well. The Miracle Shooter is a Wirless Battle option that will allow you to use items in the matches. As you fight, you’ll earn points and when you’ve got enough points you can chose to spend them on an item to help you out in the match. 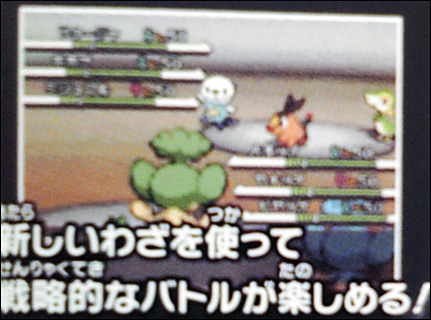 The Battle Subway is Black and White’s version of the Battle Tower having you face off against 7 trainers. Beat them all to gain Battle Points which you can exchange for various prizes. As you can see, there are a vartiation on the standard box art feturing a fringe of the oposite colour on the right side as well as having the tail of the legendary beast light up. Why there is a variation on the box art is currently unknown. 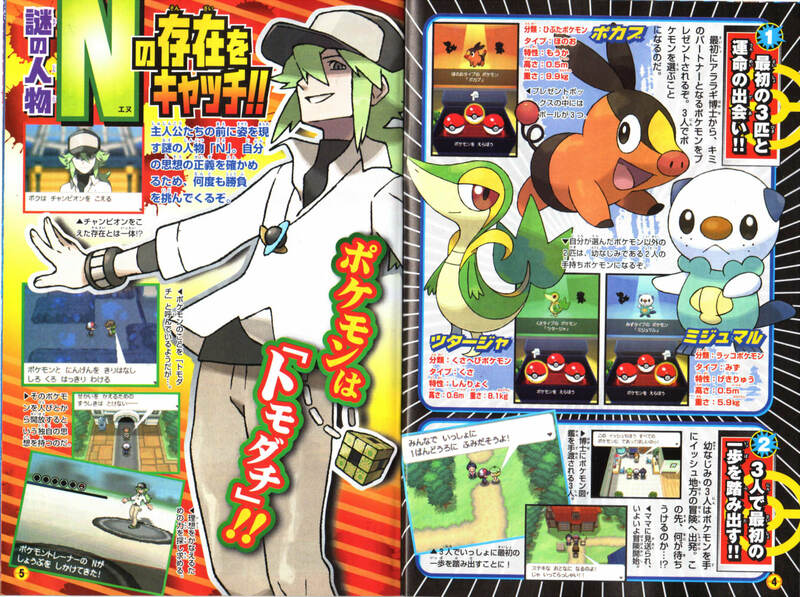 That’s all we have for now, we’ll Edit this article when we get some more info from CoroCoro Magazine. This week’s Pokémon Sunday episode recently aired in Japan and while it did not bring about any new Pokémon it did bring some new information as well as the chance to listen to some of the in-game music. The video shows off Black City and White Forest, the two areas that differ depending on which version of the game you get as well as confirming that you definitely battle Cheren and Belle. Also in a first we see the protagonist talking to N in first person with a full face shot against the backdrop of a ferris wheel. Interestingly the video also shows off the Pokémon Global Link and Dream world. From what is shown it appears that you upload your Pokémon from your game to the Pokémon Global Link which is then accessed through a website on your browser. This appears to be the dream world previously discussed. This is all tentative speculation at the moment – hopefully we’ll learn more about this soon. The video also shows off the new more animated battles. We see Kibago using some sort of physical attack that hits Munna multiple times in one move as well as some other battles between known new Pokémon. Pokémon Sunday promises to go into greater depth about 3v3 battles next week and apparently the next issue of CoroCoro is set to reveal a new legendary Pokémon. We can only wait and see! First up, Meet Cheren and Belle. Cheren is the guy and Belle is the girl. They’re old friends of your character in the game. At the beginning of the game, Professor Araragi leaves you all a present, which turns out to be the starter Pokémon. You’ll batter both of them during the game. Belle is spontaneous and your main rival, who’s strong willed (and goes on an adventure against her father’s wishes). She can, however, be unreliable at times. Cheren is intelligent and will be handing out advice to you during the game (maybe being the one to do the capture training bit that’s been in the games for generations?). Cheren intends to be the Champion of the Isshu Region. When you pick your starter, Belle and Cheren get the other two (although which one gets the type advantage over you is unknown at the moment). Since your all childhood friends getting your Pokémon at the same time, all 3 of you will start your journey at the same time (the first game where all 3 trainers with a starter Pokémon have started at once). To prove even further that the Isshu region is further away from Kanto than any other region before it, you’ll start out on Route 1 again. The guy with green hair on the left page is called N. He’s kind of a bad guy in the game. You’ll fight him several times during the game, and although he claims Pokémon are friends, he wants to separate humans from Pokémon and is looking for the power to do just that. 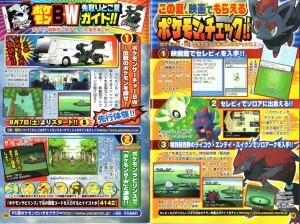 The right page shows more info on 3 on 3 battles. Basically if your Pokémon is on the left side of your team, you can’t attack the person on the far right. The only Pokémon who can attack all 3 Pokémon at once will be the one in the middle, and if they use a move that can hit all Pokémon on the field it will do more damage than usual. There is a move button on the battle screen allowing you to change the placing of Pokémon in the middle of a fight (if you enlarge the picture, its on the right page, green box, bottom left corner of the top screenshot). Still on the subject of double/triple battles, there will be a new attack that, for one turn, will be able to protect your team mates from damage from moves that can hit all Pokémon. This move is yet to be named, and no Pokémon has yet to be associated with it. These two pages deal with version differences. 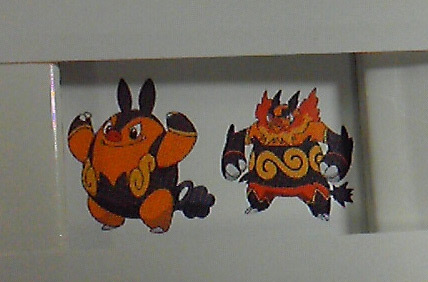 Rankurusu and Gochiruzeru are version exclusive Pokemon, but it doesn’t state in which version they will appear. 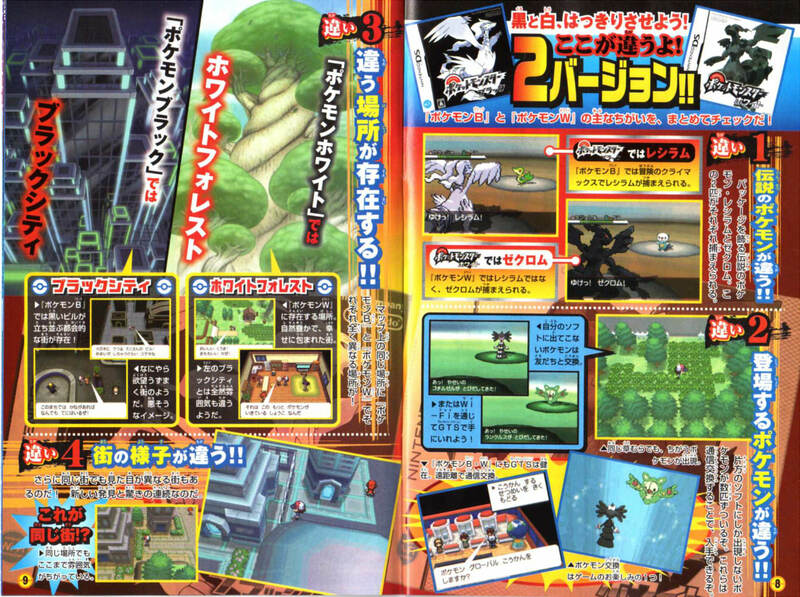 The Black City (top left of the left page) will be exclusive to Pokémon Black while the White Forest (to the right of that) will be exclusive to Pokémon White. The scans have both artwork at the top of the page while underneath each artwork is a screen shot of the area from the game. Below the explanation of the version exclusive areas, it shows two screen shots of the same city. They both look similar but different, which is explained underneath that even towns and cities that will be in both games will look different depending on which version you’re playing. Here’s the pages dealing with all the Pokémon. 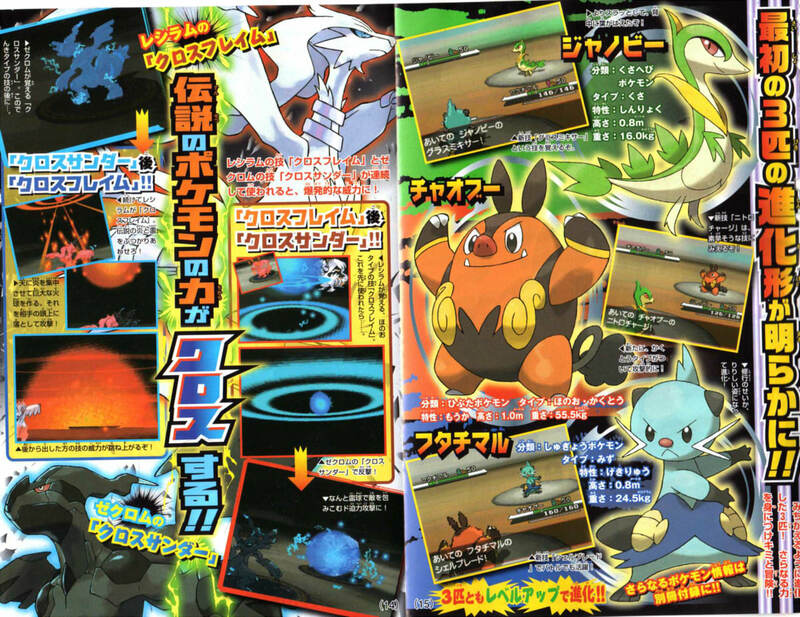 Top left, Gochiruzeru, the Celestial Body Pokémon, it will be a a psychic type Pokémon. It will have the Frisk ability and it can learn a new move called Magic Room, which actually stops the effects of ANY items played by you or your opponent for 5 turns (you can stop those full restores from Gym Leaders now). It will be 1.5m tall and weighs 44.0kg. 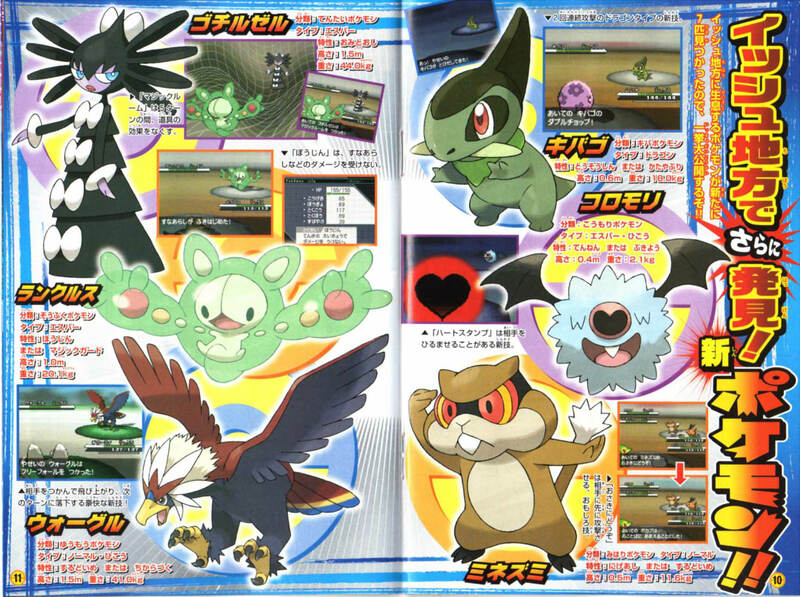 In the middle of the left page is the green blob, Rankurusu. It is the Amplification Pokemon, and another Psychic-type. It has a new ability called “Dust-Proof” which will stop it from taking damage from weather effects (like Sandstorm or Hail) Whether this ability also extends to other Pokemon is unknown. It also has the Magic Guard ability, which was previously exclusive to the Clefable line. It will be 1.0m tall and weighs 20.1kg. Bottom of the left page is Wooguru (or Wargle depending on who translates it). It is the Valour Pokémon, a (standard) Normal/Flying type. Its abilities are Keen Eye and Encourage, the same ability as Hihidaruma, which boosts the power of its attacks but prevents any secondary effects. It can learn a new attack called Free Fall, which involves the Pokémon grabbing the opponent, lifting it into the air, and then on the next turn throwing it to the ground. It stands 1.5m tall and weighs 41.0kg. 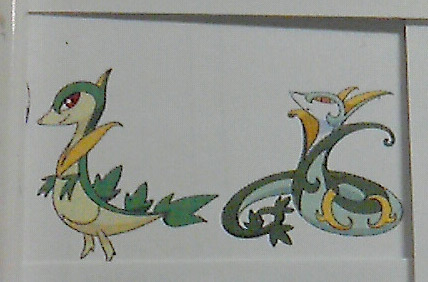 Top of the right page, Kibago (the Larvitar imitation) is the Tusk Pokémon, a Dragon type Pokémon. It has the Rivalry and Mould Breaker abilities. It will learn a new attack called Double Chop, which (predictably) hits the opponent twice. It is 0.6m tall and weighs 18.0kg. 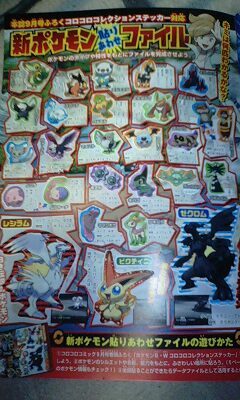 Middle of the right page is Koromori, the Bat Pokémon. It will be a Psychic/Flying type Pokémon and will have the Unaware and Klutz abilities. It knows a new attack called Heart Stamp, which can cause flinching. It is 0.4m tall and weighs 2.1kg. 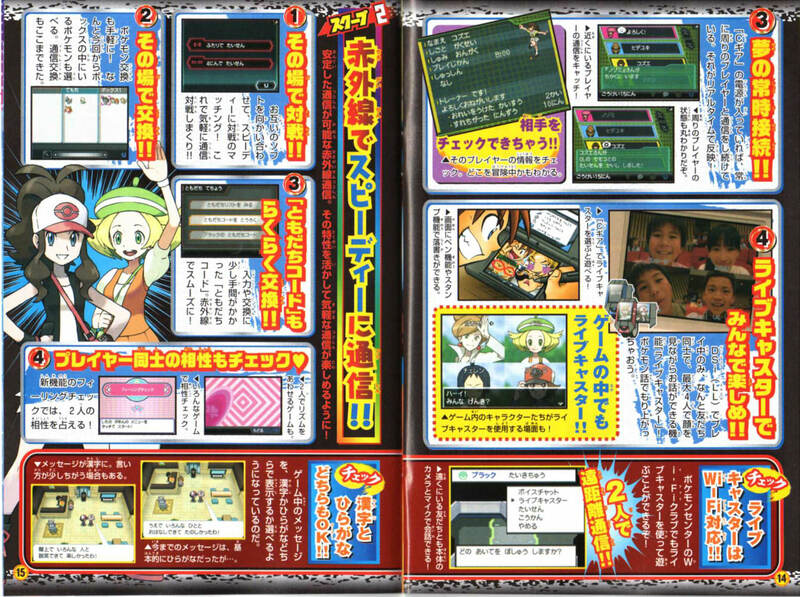 Bottom of the right page is Minezumi, the Lookout Pokémon. It is a Normal type and has the abilities Run Away and Keen Eye. It knows a new attack called “You First” that makes the opponent attack first (surely someone will come up with a reason as to why at some point). It stands 0.5m tall and weighs 11.6kg. 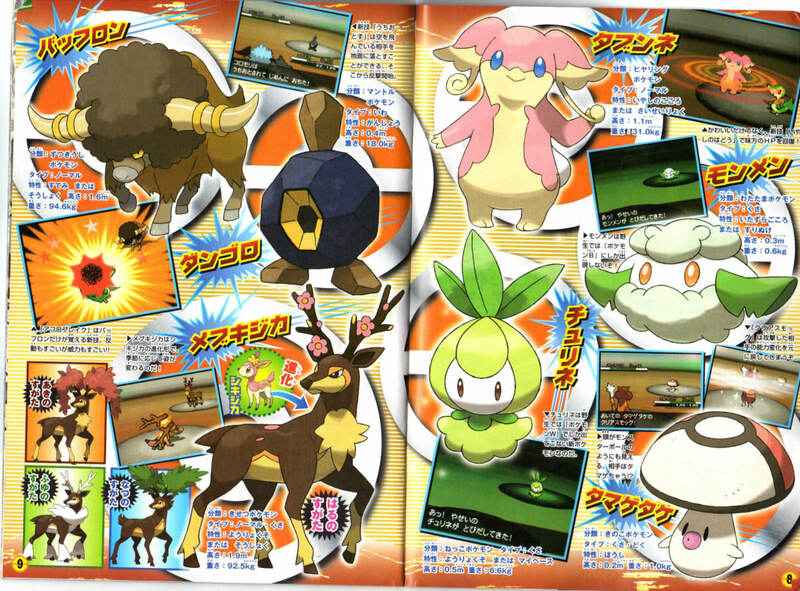 Finally, at the top of the right page is Musharna, the Trance Pokémon. It is a psychic type and the evolved form of Munna. Apparently, the dreams of Pokémon are inside its smoke and both Munna and Musharna give off this ‘Dream Smoke’. It has the abilities Forewarn and Synchronize, is 1.1m tall and weighs 60.5kg. The Dream Smoke is not just some line in a Pokedéx Flavour, you’ll be able to get it as an item. Once obtained, you’ll be able to ‘Game Sync’ which involves uploading your game to the internet. The woman on the right page is Mokomo, a friend of Professor Araragi. Once you do some kind of quest for her, Mokomo will give you the C Gear, an item involving all kinds of Wireless, Wi-Fi and Infra Red connection options. The left hand page explains the High Link building in the middle of Isshu. Using this building, you can travel to other players games and adventure with them. To what extent this Co-Op option will be, is currently unknown. This section mainly talks about various connection methods. It explains that if you battle or trade using the Infrared connection instead of wireless, it can speed up both functions. It also says you can quickly exchange friend codes using infrared. Interestingly, the Pokéwalker uses Infrared to connect to HG/SS, so it may be possible to use the Pokéwalker with Black or white, or the infrared will be used to transfer your pokemon from HG/SS to Black and White. The Passing By feature is part of the C Gear, which most likely means it is NOT a 3DS feature as speculated by us in the last news post. Using this Tag Mode feature, you’ll be able to help other people on their journey, or they can help you. To what extent, we do not know yet. The Live Caster mode used to video chat with people (4 locally, 2 over wi-fi) and will have pictures on the bottom screen, which you can scribble on during the chats. Interestingly you’ll actually get Live Caster from some characters in the game itself, at one point from N.
A new feature called ‘Feeling Checker’ will check players compatibility. This is more minigame stuff, such as the game shown where two people have to keep a rhythm, the closer you both are to each other and the better your compatibility. While not a major point for all of us in the west, the games in Japan will now feature a second language, Kanji. It also explains that the story will slightly change for those using Kanji, possibly because its mainly an older audience who use Kanji so it could be a bit darker. Still, as already mentioned, this won’t effect or be reflected in the English version when it’s released next year. The Pokémon Global Link is the service used to upload you Black or White save file onto the internet (well, a specially made website anyway). You’ll unlock this option when you evolve Munna into Musharna. It will have 2 options when you use the Global Link. 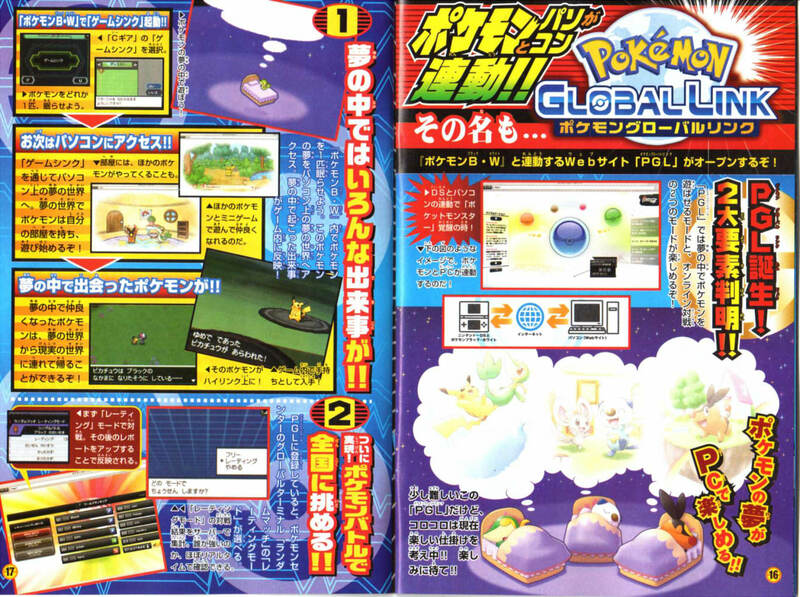 The other function of the Global Link is being able to let a Pokémon play in a dream. Reading like an evolved version of the Pokéwalker where you don’t have to walk anywhere with it, the ‘World Of Dreams’ will feature rooms where your Pokémon can play, as well as mini-games to partake in. Your Pokémon can befriend Pokémon in this dream world, and using the Game Sync option, you’ll be able to bring one of those Pokémon you’ve befriended back to the real world with you. 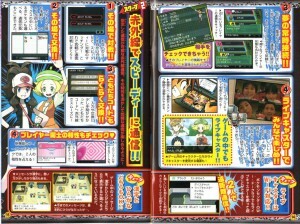 You’ll be able to get some Pokémon not normally available in Isshu using this method. Lastly the bottom left page explains that the Daisuke Club is running some kind of World of Dreams event during August, possibly to explain exactly how the function will work. During this event you can encounter any one of the Eeveelutions in the dream world. Whether you’ll be able to send this Eeveelution to your black and white game when its released (and you’ve unlocked the Global Link) is only speculation at this point. The page on the right explains the Zorua event again (which was already explained last month) as well as how Zoroark’s Illusion ability works (again, explained last month).